In a branch of Tesco the Spice Girls are all trying to buy Christmas gifts for each other, however as they spot each other they hide. 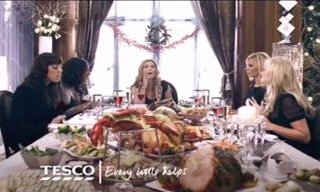 The Spice Girls are back together for Christmas and bickering over what should be for Christmas Lunch, with everyone wanting something different, so Geri has them all shop for themselves at Tesco. Back at home The Spice Girls are enjoying their Christmas dinner and the conversation about when to open their presents starts and again they all have a different opinion on when you should open them.